India are red hot at home and they are frothing to beat Australia. They had a massive chance to go 2-1 up today in Ranchi. Personally I thought we were done. 2 wickets down, 130-odd behind on 1st innings and heading into the fifth day. Chances were Jadeja and Ashwin were going to murder our top order. After touring the Taj Mahal at dawn and then heading to the Agra Fort we headed to a shop to examine some marble scultptures. All out of our price range. Conversation soon turned to cricket. Away from the hotel’s wifi we had no internet and needed a source of information. It wasn’t far. A few blokes laughed after they saw our faces when the news broke. Smith was gone and we had lost 4/75 and were still 70-odd runs behind on 1st innings. Surely we were gone. Five hours and 124 runs later we were still alive. Shaun Marsh and Peter Handscomb had batted defiantly and resisted the predatory Indian spinners. The record books will show a draw, but this partnership and the performances by Smith and Maxwell then Pujara and Saha were of supreme quality. On a pitch that had looked like rolled mud on day one we were treated to memorable batting. It was a privilege and an unforgettable experience to play some cricket with these kids. They were nearly as excited I was. Amazing – getting to see the first Test at that beautiful venue as a series decider. Hope you have a ball! 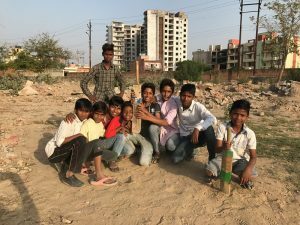 And to play backyard cricket in India without trying to sell vitamins – all the better. I am the first to admit that I did not think Australia would be in a series-winning position. But, I am happy to have been proven incorrect. So good, Pat. So good. Probably a full-on sensory workout is ahead of you.